Join Prof. Magnuson and the other Friends of The History Center for their spring event on Saturday, April 21 at Calvary Church in Roseville. After coffee and refreshments at 9:30am, the program will begin at 10am. This year’s featured speaker is Ron Dischinger, retired CEO/president of the Elim Park Baptist Home in Cheshire, Connecticut (and former Bethel History student — find him on our alumni map). In addition to his nearly four decades at Elim Park, Ron served at the Klingberg Children’s Home. Both institutions are rooted in the historic social ministry of the Baptist General Conference (now known as Converge). (Learn more about Klingberg in the May 2008 issue of The Baptist Pietist Clarion.) In his talk, Ron will trace some of that history, plus the program will feature some creative social ministries being carried out by Converge churches in the Twin Cities. And guests are invited to stop by the oral history table to share their own story of social ministry. The program is free, but attendees are encouraged to register online and bring a food item to donate. On Saturday, November 12, 2016, friends and fellow travelers of The History Center gathered at the Underground for the program “Honoring God Through Sports and Athletics.” Three coaches—Gene Glader, Tricia Brownlee, and Steve Johnson—presented the history of athletics at Bethel University. In the 195os and 60s, Dr. Gene Glader was coach or assistant coach for four men’s athletic teams (football, basketball, track and cross country), intramural director, instructor in physical education, athletic director, and chair of the physical education department. Glader’s presentation highlighted the challenges of athletics at Bethel in the two decades before the campus moved from the Snelling Avenue location to Bethel’s current home in Arden Hills. Only basketball had “home” turf with a campus gym; all other sports had to scrounge around the area for practice and game fields. Glader described the men’s football team practicing on the quadrangle lawn of the Snelling Avenue campus. This was also the era before Bethel had a conference affiliation, so coaches were on their own to organize a “season” of athletic competition for their teams. Nine of Dr. Tricia Brownlee’s 33 years at Bethel were in the physical education department. Brownlee started the volleyball program in 1968 at the urging of female students, and the softball program in 1969. The remainder of Brownlee’s years at Bethel were in the academic dean’s office, retiring in 2001 from her role as Dean of Academic Programs. In addition to narrating Bethel’s athletic history from the 1970s to the present, Brownlee’s presentation highlighted the impact Title IX (1972) had on women’s athletics at Bethel and the stunning successes of women’s teams beginning in the mid-1980s. Steve Johnson, now in his 28th year as Bethel’s head football coach, shared through a prerecorded video interview. For those familiar with Coach Johnson, he stayed true to form with an emotional testimony about the interaction of faith and sports in the lives of athletes and coaches. The event also featured athletic artifacts from The History Center and a book sale of publications produced by the Friends of The History Center. One of the benefits of serving as director of archives is overseeing the acquisition of some really cool stuff for the History Center collection. And yes, “really cool stuff” is technical jargon in the archival world. In recent years the History Center has received a number of objects that not only strengthen the collection but also enhance our ability to tell meaningful stories about Bethel University and Converge Worldwide. Bethel Alumni Coffee Club mugs. The “coffee club” alumni fundraising campaign began in 1984 and continues to this day. The History Center has a nearly complete collection. We are missing the mug from 1986. Is it in your cupboard? Nancy Lundquist’s briefcase. Nancy Lundquist was the wife of Bethel College president Carl Lundquist. Beginning in the 1960s and well into her retirement, Nancy was a sought after speaker for conference women’s events and retreats. History Department sign. This metal sign hung outside the History Department House, 1446 Arona Street, located near the old Snelling Avenue campus in St. Paul. After the move to Arden Hills, the sign was displayed inside GW Carlson’s office until his retirement. Lantern projector, glass slides, microscopes, and pull down science charts from Bethel’s Department of Biology. Teaching technology has certainly changed over the last one hundred years! Bethel College president Carl Lundquist’s academic robe and wooden lap desk. These items give testimony to Dr. Lundquist’s public and private academic life. The class of 1925 donated funds for a brick gate at the street entrance to the Bethel Academy building, located at Snelling Avenue in St. Paul. The “Class of 1925” stone that was integrated into the gate is now part of the History Center collection. Corbels from the Snelling Avenue Bethel Seminary chapel. Even these small architectural elements have a big story to tell. Bethel’s 2007 Regional Emmy Award for “Audio-Post Production, Bethel University Festival of Christmas.” Bethel University won an Emmy?! Who knew? The golden Emmy statue came in a beautiful box too! A small carpet square from the original carpet installation in the Bethel University library. Gold was a popular carpet color in 1972! If you are thinking to yourself, “Gee, I’ve got a ———, I’d love to donate to the History Center,” please contact me before bringing your treasure to the archive. Our space is limited, and you may be surprised to find out we already have the item you wish to donate! History Majors Win 1st and 3rd Place in 2015 Library Research Prize! Congratulations to Fletcher Warren ’15, winner of the 2015 Bethel University Library Research Prize for his Senior Seminar paper, “‘A Long Way from Minneapolis’: Minnesotans in the Spanish Civil War.” And to Kelly Van Wyk ’15, winner of 3rd place in the same competition for “The Paneled Lives of Extraordinary Women: Comic Books, Superheroines, and American Women in the 1940s” (also from Senior Sem). Drawing on primary sources at multiple archives in addition to the holdings of the Bethel Library, Fletcher explored the motivations and experiences of the sixty Minnesotans who fought in the International Brigades during the 1936-1939 conflict in Spain. The Library prize is not the first contest Fletcher has won with work connected to this project, which he’s now developing into a book-length manuscript. A chapter detailing the ideological background of the Minnesotan volunteers for the Republican side in the Spanish Civil War won the Undergraduate Prize in the 2014 George Watt Essay Competition, from the Abraham Lincoln Brigade Archives in New York. Kelly will be presenting her innovative work on comic books as a primary source at the Minnesota Undergraduate History Symposium — April 25 at Bethany Lutheran College in Mankato, MN. Author Chris GehrzPosted on April 9, 2015 Categories Archives & Libraries, Courses, Events, News & Announcements, Senior SeminarLeave a comment on History Majors Win 1st and 3rd Place in 2015 Library Research Prize! Episode 4 of Past & Presence, our department webisode, is now available! This week’s was an especially rich faculty conversation, as we talked with Diana Magnuson and AnneMarie Kooistra about the nature of historical evidence and research. Not only did we discuss primary sources and why they’re fun to use in teaching, but we reflected on the experience of conducting archival research — which struck us as both sacred and earthy, frustrating and energizing. Diana was also kind enough to take us on a virtual tour of The History Center, the archives of the Baptist General Conference and Bethel University in the upper floor of the Bethel Seminary Library. While we were up at the Sem, we shared some of its long history and visited Scandia Chapel, the oldest surviving Swedish Baptist church building in the state of Minnesota. Rounding out episode #4 are conversations with Amy Poppinga about HIS356 Modern Middle East, Fletcher Warren ’15 about his semester in Oxford, and Brandon Raatikka ’03 (who also spent a semester in Oxford) about his journey from AC 2nd to his current position as vice president of risk assessment with FactRight, LLC (by way of the University of Minnesota Law School). It’s been far too long since we interviewed a Bethel History student or recent alum who has completed an internship! So let’s hear from Gretchen Luhmann ’14, who spent part of her last semester at Bethel working at Eidem Homestead, a living history site in Brooklyn Park, Minnesota. First things first: why did you pick a History major? Did you come to Bethel knowing you wanted to pursue that course of study? Coming to Bethel I knew History would be my major. Whether or not I would pair it with another major or minor, I knew History would be my focus because it had been a favorite topic of mine since childhood. I wasn’t really sure what I would end up doing with it, but the thought of working in a museum where I could tell stories of the past and actually “do” history thrilled me. How did you become a spring intern with Eidem Homestead? Were you looking to work there in particular? I was looking for internships with a museum or archive to establish connections in the area and to learn how to professionally care for objects and documents, but also to figure out which area of museum or archival work I was most interested in. I had experience working in the Archives of the Baptist General Conference and Bethel University, but thought looking into other areas was wise before continuing on with graduate school for a master’s in Library and Information Science. Eidem Homestead is a living history museum that Dr. Gehrz mentioned to me early in the fall of 2013, but found again when researching smaller museums and libraries in the area where I was hoping to find internship opportunities. For those who haven’t been there before, describe Eidem Homestead. Eidem Homestead is a living history museum in Brooklyn Park. John and Lectty Eidem moved onto that farm in 1894 where they planted potatoes and raised sheep, like most farmers in the area. For visitors, you experience what life in rural Minnesota would have been like between 1890 and 1910. You can tour the house and barn, check out the farm animals in the spring and summer, experience the daily work that each member of the family contributed to the farm, and take part in the many events throughout the year geared to all ages. What kind of work did you have the chance to do as a museum intern? At the beginning of my internship in the spring of 2014, when the farm was quiet, most of my time was spent researching in order to write descriptions for future display signs around the farm. I researched the 1890-1910 period, the Brooklyn Park area, rural life, immigration, and also various objects around the house and barn to get an understanding of their importance and function. The interpretive signs enable visitors to read and learn about basic aspects of life on the farm at that period, but also set the stage for what happened throughout the United States and what concerns people had at that period. The closer it got to the spring and summer events, the more my work transitioned to programming. I worked on bringing together ideas and preparing the farm for the opening events. What was most exciting or enjoyable about it? What was challenging? I enjoyed working at Eidem, which has a smaller staff, because that meant that I would have a number of experiences rather than working in one specific department. With that, I was able to research, but also get the house ready for visitors by pulling out knick knacks and rearranging furniture, and went through boxes and trunks of various things creating an inventory. While I loved the various jobs I was thrown into, coming up with ideas and planning accordingly for events was difficult. I found myself wishing that I had experienced an event as a visitor myself prior to the internship to get a feel of the crowd and how the events logistically worked. With that said, Eve Burlingame, the Eidem Farm Coordinator, was a great sounding board for my suggestions and helped make them a reality. Do you see yourself doing similar work as a career? Has the internship experience influenced your thinking about work and education in the coming years? Parts of the internship I am working towards for a career. I loved the research aspect and going through old documents and boxes. Yet at the same time, I do not necessarily see myself at a living history museum. The internship did impress upon me how much I love research and working on the more academic side of history. As of now, I am planning on going back to school to get a master’s in Library and Information Science to become an archivist. What advice would you have for our majors who are interested in seeking internship experiences? Definitely do it! Even if you think it may not be an area you are completely interested in, it helps with networking and honing in on what it is that does interest you. For me, I needed that experience to figure out that I enjoyed the behind the scenes research process more than being in front teaching others about that history. Also, don’t only look into museums that already have established internships. I found multiple smaller museums and county historical societies that were willing to work with me, so make sure to check out all your prospects – it never hurts to ask! If, like Gretchen, you’re interested in receiving HIS credit for your internship, get in touch with department chair Chris Gehrz. The for-credit option simply requires that you work a certain number of hours (varies by number of credits), that you arrange a supervisor on site and back at Bethel, and that you complete some reading and writing to help you reflect on your experience. Many myths surround the Smithsonian Institution’s archives—from legends of underground facilities hidden beneath the National Mall to rumors of secret archaeological excavations. One underlying truth persists amid these fallacies: the Institution’s archives are indeed massive. Preserving these collections in a digital age is a gargantuan task, especially when it comes to handwritten documents. Ink fades with time, and individual scrawls sometimes resemble hieroglyphics. It could literally take decades. The Smithsonian, instead, aims to shorten that timeframe with the help of anyone with an Internet connection…. they issued a called [sic] for volunteers to help decipher everything from handwritten specimen tags to the personal letters of iconic artists to early U.S. currency. “For years, the vast resources of the Smithsonian were powered by the pen; they can now be powered by the pixel,” Smithsonian Secretary Wayne Clough said in a statement. Go to the Smithsonian’s Transcription Center if you’re interested in volunteering to transcribe diaries, letters, notebooks, and other primary sources. The projects associated with the National Museum of American History have already finished, but many others remain open, including several at the National Archives. As the Smithsonian article noted, it’s following in the path of other leading archives, museums, and libraries, including the New York Public Library (which pioneered historical crowdsourcing, using 19th century restaurant menus — that project continues) and the UK National Archives (continuing to transcribe 1.5 million page of unit diaries from the First World War). We’ve written about crowdsourcing here, and here. When we realized Steve Miller Band and Journey were only coming as close as Kansas City, Dana knew she had to see them. Lynae, however, was not sold on the concert. That is until we found out there are more historical destinations on the road to Kansas City, Missouri than at first glance. Our first stop was unplanned. We had spent the night in Mason City, Iowa, and our dad mentioned that Buddy Holly, Ritchie Valens, and The Big Bopper had played their last show in neighboring Clear Lake before perishing in a plane crash. We set out to find the memorial dedicated to the musicians and the pilot. The site is literally in the middle of two cornfields outside of Clear Lake and was marked by a statue of Holly’s trademark glasses. A half-mile walk on a dirt path brought us to a small steel tribute, decorated with tokens from fans all across the country. We met one such fan and his father slowly making the long walk towards the memorial as we left. His steps were difficult due to the fact that he had been mostly bedridden for the past several years, recovering from a brain tumor he had as a child. Now a teenager, he had wanted to visit the site with his dad. They drove seventy miles from the Mayo Clinic, and as they pulled up to the field, “La Bamba” by Ritchie Valens started playing on their satellite radio. They were awestruck by the coincidence and took a picture of the radio itself to capture what was for the teenager a dream come true. 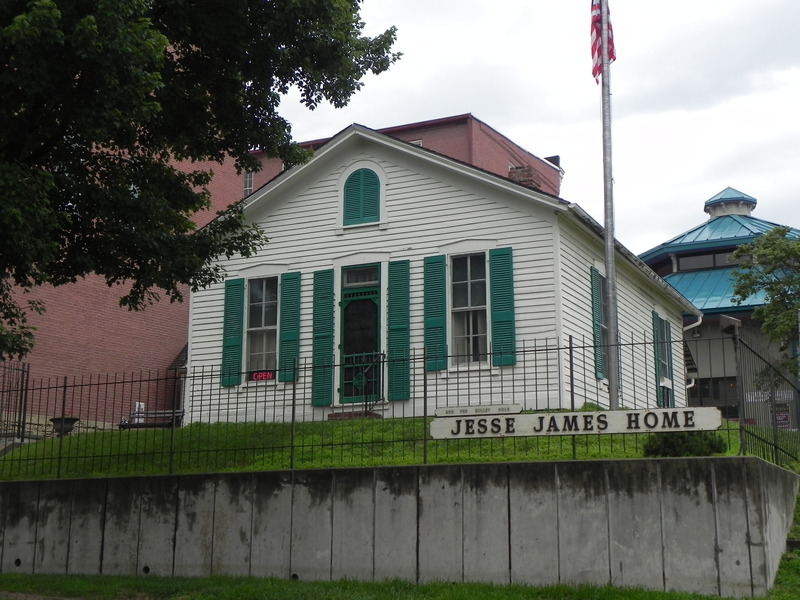 Our next stop was St. Joseph, Missouri, where we visited the Pony Express Museum and the Jesse James Home. James and his family had been living in the home in St. Joseph for four months when Robert Ford shot and killed James as he fixed a picture on the wall. Independence, Missouri was the next destination. Located just outside of Kansas City, it is home to the Harry S. Truman Presidential Library and Museum. Truman worked at the museum after it opened in 1957, giving tours to visitors and even answering incoming phone calls to give directions to his museum. In addition to two permanent exhibits, the museum features a temporary exhibit: “Spies, Lies and Paranoia: Americans in Fear” at the time of our visit. One thing we both appreciated about the museum was that it didn’t gloss over the hardships and unpopular choices his administration faced. From quotations reflecting on the decision to drop the atomic bombs on Hiroshima and Nagasaki, both for and against the act, to letters of hate mail sent to Truman after the firing of General Douglas MacArthur at the height of the Korean War, the museum presented his time in office in a realistic, non-idealized way. After a full day of visiting the Pony Express, the Jesse James Home, and the Harry S. Truman Presidential Library, it was time to enjoy the Kansas City air with the outdoor concert of Steve Miller Band and Journey. Both bands entertained audiences, just as they have been for the last 40 years. 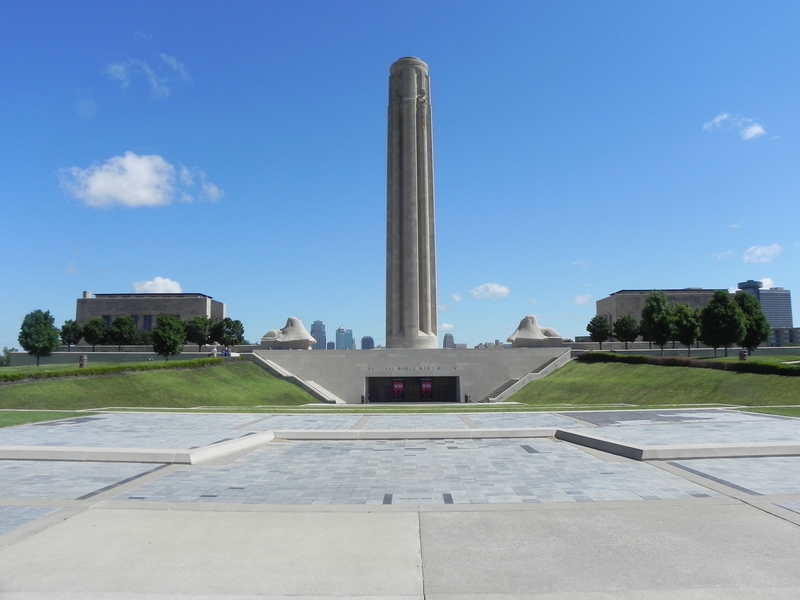 The final destination on our Midwest tour was the Liberty Memorial, which houses the National World War I Museum. Initial planning for the memorial started almost immediately after the end of the war in November of 1918, with an opening in 1926. But it would be another eighty years before the museum, located under the memorial, opened for visitors. 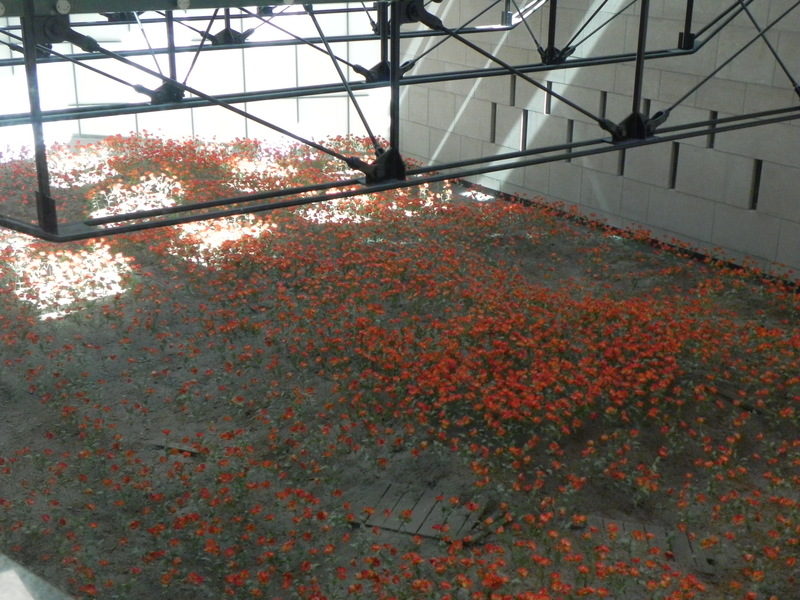 Immediately upon entering the museum doors, we were welcomed by a field of red poppies below a glass walkway. There were exactly 9,000 poppies below our feet, each one representing 1,000 military deaths during the war. The somber greeting led us to the rest of the museum, a detailed and expansive dive into the global war that raged for four years. The museum was split into two sections. The first section laid out the causes of war and the types of fighting in Europe during the first three years of the war. A brief film detailing the causes of why the United States entered the war ushered us into the second section, devoted entirely to the U.S. perspective. An interesting tidbit presented at the beginning of the exhibit was how much importance was placed on pomp and showmanship at the onset of the war, specifically in military attire. The French initially wore a bright red and blue uniform originally used in the 1860s; it quickly proved to be an easy target. Also, soldiers soon found there was little need for swords and lances, relying instead on equipment that could be carried more easily and proved more effective. The museum had an impressive collection of artillery, machinery, and weaponry, as well as recreations of British, French, and German trenches. It also featured an interactive section including study stations and booths that played audio testimonies from soldiers. It allowed us to submerge ourselves into the chaos and triumph that permeated through the world 100 years ago. Thanks to Dana and Lynae! We’d love to publish more posts like this, so if you’re an alum or student and want to write about your encounters with history as you travel, just get in touch with Prof. Chris Gehrz.